Am tired of discussing how cold it is here in the Northeast. It's winter. In winter, it's cold. This is colder than we're used to but still,it's not entirely unexpected. What these extreme temps do for me is that I now really appreciate whenever it's at least 30 degrees posted in the upcoming weather forecast. That actually begins to feel like an "indian" winter if we can say that anymore. I love a clever idea -am often envious of them in a "why didn't i think of that" sort of way. 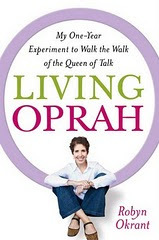 This book by Robyn Okrant -Living Oprah is the latest in that department! Robyn set off on a social experiment -for one year she was going to live everything Oprah. Every suggestion from what to wear to how to organize. Robyn's online blog www.livingoprah.com became so popular she was approached with a book deal. See what living Oprah can do? Along the way many interesting lessons learned with perhaps the biggest being that we were home all along! Read this!